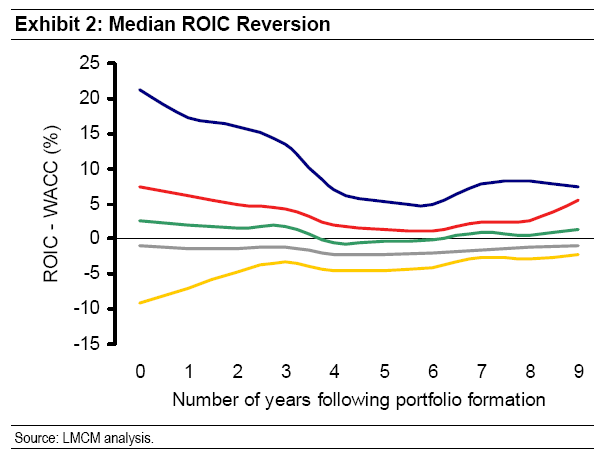 Yesterday I discussed Michael Mauboussin’s December 2007 Mauboussin on Strategy, “Death, Taxes, and Reversion to the Mean; ROIC Patterns: Luck, Persistence, and What to Do About It,” (.pdf) about Mauboussin’s research on the tendency of return on invested capital (ROIC) to revert to the mean. The goal of the investor is to identify businesses with future, sustainable, high ROIC. 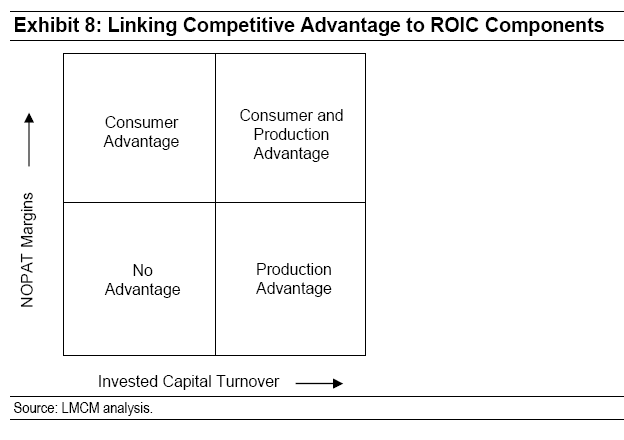 Mauboussin explores three variables that might be predictive of such persistent high ROIC: corporate growth, the industry in which a company competes, and the company’s business model. Mauboussin finds that industries that are overrepresented in the highest return quintile throughout the measured period are also overrepresented in the lowest quintile. Those industries include pharmaceuticals/biotechnology and software. He concludes that positive, sustainable ROICs emerge from a good strategic position within a generally favorable industry. 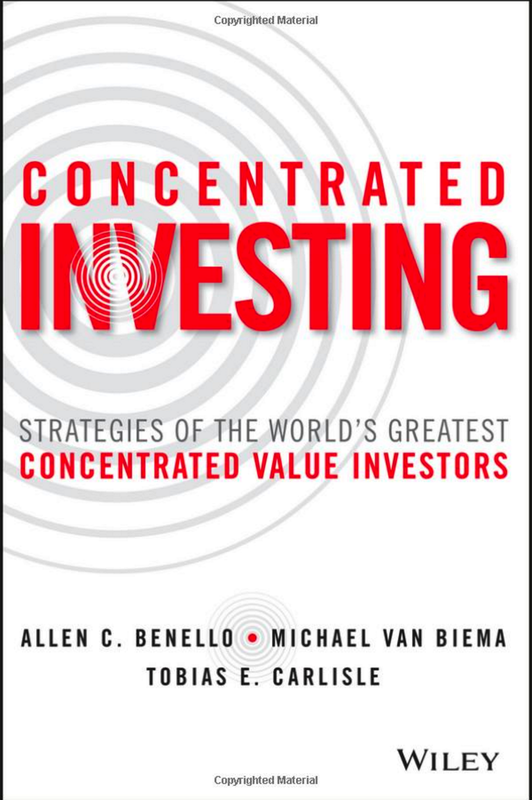 Generally speaking, differentiated companies with a consumer advantage generate attractive returns mostly via high margins and modest invested capital turnover. Consider the successful jewelry store that generates large profits per unit sold (high margins) but doesn’t sell in large volume (low turnover). In contrast, a low-cost company with a production advantage will generate relatively low margins and relatively high invested capital turnover. Think of a classic discount retailer, which doesn’t make much money per unit sold (low margins) but enjoys great inventory velocity (high turnover). Exhibit 8 consolidates these ideas in a simple matrix. 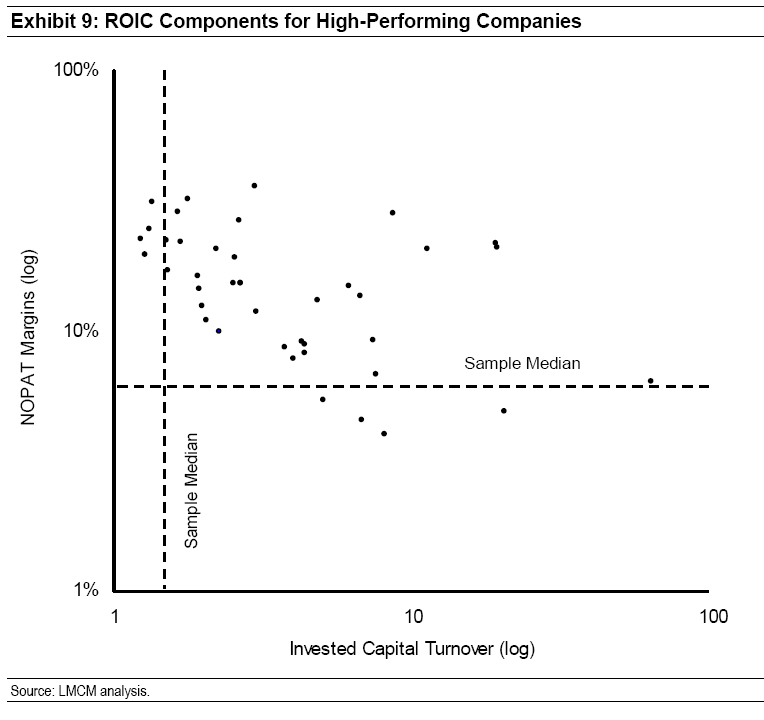 Not surprisingly, this group outperformed the broader sample on both NOPAT margin and invested capital turnover, but the impact of margin differential (2.4 times the median) was greater on ROIC than the capital turnover differential (1.9 times). While equivocal, these results suggest the best companies may have a tilt toward consumer advantage. An analysis of the poor performers reveals that they posted NOPAT margins and invested capital turnover “symmetrical” with the high-performing companies i.e. below the full sample’s median. It is impossible to infer the cause of persistence in performance from the fact that persistence occurs. Persistence may be due to fixed resources, consistent industry structure, financial anomalies, price controls, or many other factors that endure . . . 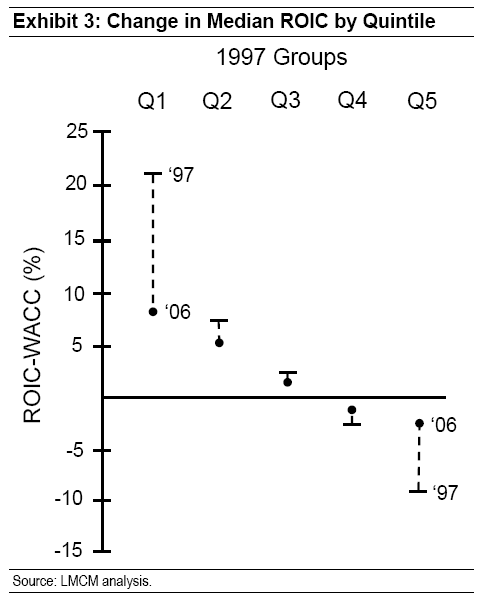 In sum, reliable inferences about the cause of persistence cannot be generated from an analysis that only documents whether or not persistence occurred. 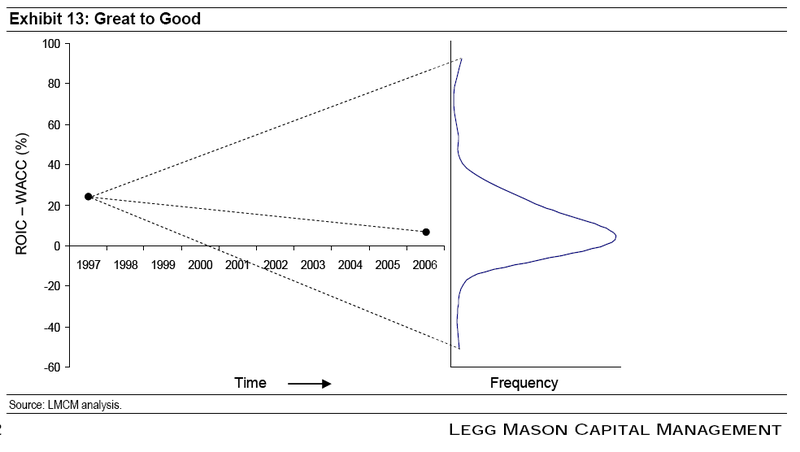 Mean reversion is a favorite investment topic here on Greenbackd (see, for example, my posts on Mean reversion in earnings, Contrarian value investment and Lakonishok, Shleifer, and Vishny’s Contrarian Investment, Extrapolation, and Risk). LSV argue in their paper that most investors don’t fully appreciate the phenomenon, which leads them to extrapolate past performance too far into the future. In practical terms it means the contrarian investor profits from other investors’ incorrect assessment that stocks that have performed well in the past will perform well in the future and stocks that have performed poorly in the past will continue to perform poorly. The outstanding Shadowstock blog has identified five “strong candidates for mean reversion.” To see John’s Shadowstock.com analysis, click here. One of the most fascinating examples of the phenomenon of mean reversion was identified by Werner F.M. 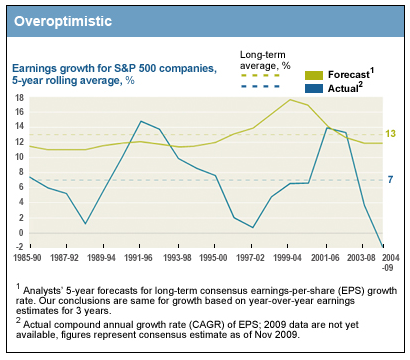 DeBondt and Richard H. Thaler in Further Evidence on Investor Overreaction and Stock Market Seasonality. 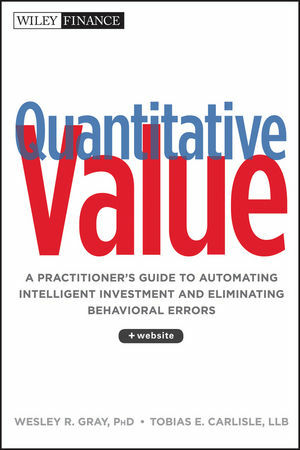 DeBondt and Thaler examined the relative performance of quintiles of stocks on the NYSE and AMEX ranked according to book value. As an adjunct to the main study, one of the variables they analyzed was the relative earnings performance of stocks in the lowest and highest price-to-book quintiles. The implication here is that not only does the price of stocks that are cheap relative to other stocks regress to the mean, but the underlying performance does too. That’s an amazing finding. 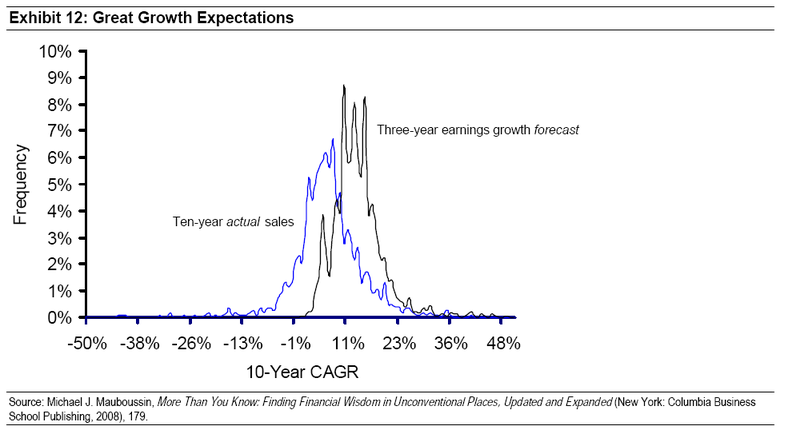 There’s really no good reason why low price-to-book should be such a good predictor for short and mid-term earnings growth. I’ve spent some time thinking about why this might be so, and the only possible explanation I can come up with is magic. Nothing else fits.